Welcome back to The Brazen Woman series. This month we are highlighting Evelyne Nyairo, founder of Ellie Bianca - an all-natural skin care line. She walks her talk in empowering women and environmental sustainability. 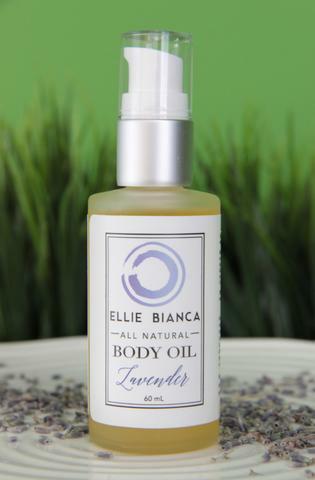 I must put a little product plug here and say I use the Ellie Bianca Lavender oil and I absolutely love it! Read my interview with Evelyne. The Brazen Closet: How did Ellie Bianca get started? Evelyne: I always knew that I wanted to do something big, that involved empowering women, but I wasn't sure what. About five years ago I took a project in Chad, with a Canadian company, as the Environmental Consultant for a bridge and road construction project. My job was to ensure international standards were met and the river was not contaminated during and after construction. It was mango season at the time and I had always wanted the experience of eating a mango fresh off the tree and not just buying from the market. I asked my guide, and we walked to a small farm with some mango trees. The husband was laying in the shade taking a nap, while the wife and kids were working. The wife was so welcoming. She plucked the mangoes, I ate as many as I could and she packed a basket full for me to take with me. When it came time to pay, it was only 25 cents, which I thought was ridiculously cheap and I wanted to give her $20 for all her hard work. She immediately declined collecting the money and my guide quickly corrected me, that the custom was to give the money to the husband as the head of the household and as a sign of respect. This really hurt me. I thought, here was this woman who had done all the hard work with the husband sleeping in the corner and I had to give the money to him, in this day and age? I’m from Africa and I didn't know that customs like this were still in existence. This reminded me of my personal journey and various experiences of being disrespected just because I’m a woman without regard for my skills, intelligence and professional experience. This was exactly what I didn’t want my daughter to have to go through. The narrative that women are somehow second class is one we need to continue to advocate against. When I came back from my trip, I couldn’t get the experience out of my head and I started brainstorming with my sister and daughter on what type of business I could do, to empower these women. I wanted a business, because I believe that is where true empowerment can be created and not from a nonprofit. I believe that the time for nonprofit has come and gone, and we haven't really seen tangible results. From my trip, I noticed that women in Chad have very beautiful dark skin without any blemishes. This always fascinated me. As hot as the weather is and I’ve always wondered how they are able to keep their skin so nice and smooth. I found out that their secret was Shea Butter. They have abundant shea trees and the women make their own shea butter from scratch and I saw this as an opportunity where I could work with the women. The idea of creating a line of natural beauty products was very appealing to me. Cosmetics is something women love and I also saw it as a way to bring women together to start having conversations on how to truly create empowerment. On my next trip, I came home with some shea butter and started doing some testing. That was how the idea was born. The Brazen Closet: That’s amazing! How did you create Ellie Bianca as a brand that reflects you? Evelyne: Ellie Bianca is actually my daughter’s name, she inspires me and is truly the inspiration for the brand and what it stands for. She is my biggest supporter and I want to leave a strong legacy for her and also inspire her that she can truly BE anything and DO anything! I’m very big on natural products. But one of the biggest struggles with natural products is they look very dull, “natural” has been reduced to bronze and green. But when you think of nature, it is full of colors, from deep greens to blues and yellows. The luxury in nature is also missing from natural products. I wanted to close that gap by creating something natural, luxurious and beautiful. The market is also very competitive and people even tried to discourage me. But when I started making product samples, one of my “discouragers” saw how serious I was and introduced me to a branding team to help me do it right. I met with them and we had a branding session where we explored ideas and the values and message I wanted to convey with the brand. The main pillars of the brand are “Kind to your skin” by providing quality natural skin care without the use of synthetic materials. “Kind to the Earth” I believe in living sustainably making sure we leave things better than we met them. “Kind to Women” ensuring we are not only talking about empowering women but actually doing something tangible to support that statement. My intention is to build a successful brand from scratch and make it big and at the same time something that other people can relate to and be inspired. I picture a young woman walking into a store seeing one of our products saying I know the owner of this line. So that girls can begin to see successful women around them everyday and be able to identify with them. That if she can do it, then I can do it too! That will also really help to foster a community where women are coming together, with women supporting each other. The Brazen Closet: That is amazing! I’m sure the journey has not been easy. How have you dealt with any doubts or fears as you keep this dream going? Evelyne: We are actually launching a network very soon, called the Ellie Bianca Woman. The Ellie Bianca woman is bold and not afraid of failure. But what is different about the Ellie Bianca woman is that when she falls she gets up. She recognizes that if something is not working, it is time to try something different, she's daring and she takes risks. But she takes calculated risks. I think about this and yes there are fears and doubts that come up all the time but it is how we deal with them. There have been times I’ve asked myself why I’m doing this? When I'm providing consulting services, it is my knowledge that I'm selling. I do my job, I get my check and I walk away. I have invested nothing. But with Ellie Bianca, my name and brand are on the line. I’ve invested the time and the expenses of formulating, getting the raw materials and everything. And the result for example is a $40 bottle of oil. So I’ve wondered, how many bottles am I ever going to sell to break even. But I love the challenge and this is more than just oil, there is a mission and that's what excites me the most. The Brazen Closet: In addition to that, what motivates you in spite of every difficulty? Evelyne: I am motivated by what I have envisioned for the brand. I believe in looking ahead 10-20-30 years to the big picture and what you want the end result to be. I envision Ellie Bianca 30 years from in every store where it is the sought after brand. I can see the end result now; I just have to do the work to get there. There is definitely a lot of uncertainty along the way but I know the end result and I just have to do the in-between. The Brazen Closet: What do you know now that you wish you knew when you started and what advice will you give to someone starting out? Evelyne: With business in general the one thing I have learnt is to be truly humble. Humility for me is a major key to success because, if you are not humble, some things will definitely happen that will humble you. Another thing I have learnt is not to be anxious. I mentor a lot of business owners and I see the anxiety. They are always anxious about how and when things will happen, they want things to happen now and they are very stressed because of it. I've learned in this whole journey that things are actually going to work out the way they are supposed to. I'm a Christian and I believe in God and believe that everything will work out the way God intended them to. I believe that if I ask for bread, God will not give me stones. He gives us the desires of our hearts. So I’m much more relaxed now. I was really anxious the past years building two business. But I’ve learnt that as I believe, work hard - sometimes a little too hard and trust in the process things will fall into place. So I'm enjoying the process as it comes. I have also learnt to listen to myself and keep following my vision. People try to copy what is out there but just be authentic. People pick up on fakeness, so just being yourself is one of the things that will differentiate you from others. I also don’t believe in faking it till you make it. There is also no alternative to doing the work. This is the fifth business I'm building from scratch and because I've just done it so many times, I know that it is hard work but it gets easier. You have to be persistent. You can’t stop working at it. You have to be consistent. Consistent in releasing good products and constantly surpassing your customers’ expectations. While you're working hard and showing up consistently, you are going to find some luck. But luck is not going to come look for you if you don’t do the work. You just have to show up and just as you’re showing up the magic happens. So I couldn't get out of it at that point even if I wanted to. The Brazen Closet: What other things do you do outside of your businesses? Evelyne: I’m involved in so many things. I’m a mentor with the Connectors program through The City of Calgary that helps new immigrants and students navigate the job market and career options. I’m also involved Womanition, where I’m one of the mentors for other business women. Womanition is the only Women’s profile magazine in Canada. It is also a Women’s network that creates opportunities for women to empower themselves by building connections through networking, sharing ideas and experiences. Womanition also hosts an annual Womanition Biz Brigade Leadership Conference, which is a one-day conference specifically for female entrepreneurs. I am one of the speakers this year as well. As a business woman, I like to share my experiences and what has worked for me and what hasn’t, to really help women build strong businesses and encourage women to think big. I feel like we limit ourselves. Why is it that we start more businesses than men do and yet, we're not making it to the millions? My big dream is to see lots of women millionaires. People always ask me why a million? I think a million dollars is the magic number, because it just changes things. I want to see lots of women have freedom. I know money doesn't buy happiness but, I also believe that if you’re really broke with bills things are even worse. I would rather be miserable and have some money in my pocket than be miserable with no money. So I want women to have that freedom. When we limit and make ourselves smaller we also limit others. So when we grow and dream big, we’re also giving other women permission. We are giving our daughters and daughters of the world that permission to dream big and achieve those dreams. I’m passionate about creating everyday role models that our daughters can look up to. Someone they know or they’ve met not someone in the distance like Oprah Winfrey, but a regular everyday person. So I’m very passionate about changing that for women and giving women the permission to do so.